The most pressing issue facing society is the need to combat climate change. Thus, it’s appropriate that so much attention has been placed on the need to reduce the emissions of greenhouse gases. Yet it’s now clear that society cannot meet the goals of the Paris climate accord unless we take steps that go beyond reducing emissions. (Source: 2018 report of Intergovernmental Panel on Climate Change) We must also remove some of the carbon that is already in our atmosphere. Farming has the potential to reduces atmospheric carbon and mitigate climate change. Not all farming practices rebuild soil health and capture carbon, but the right practices applied in the right way can make a real difference. 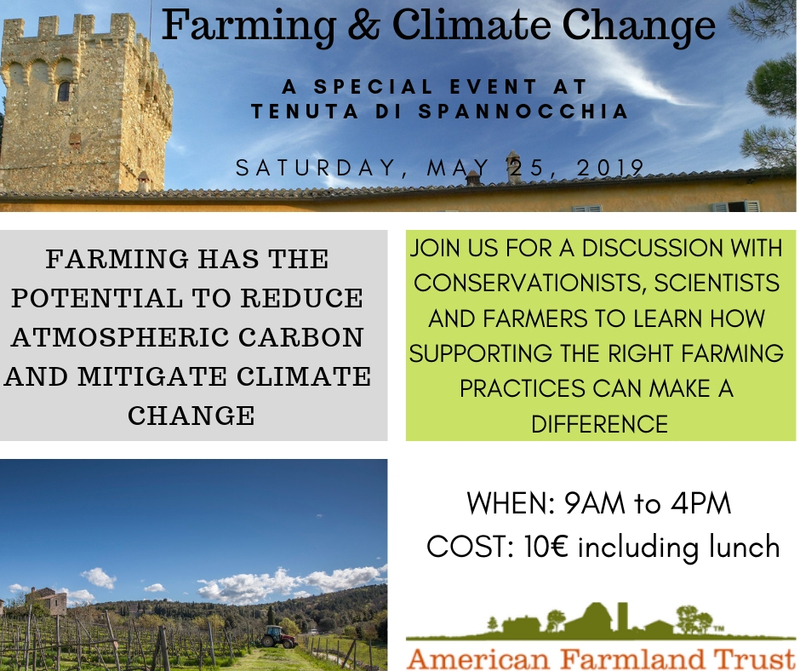 On May 25, Tenuta di Spannocchia is cosponsoring a daylong ‘colloquium’ that will explore the promise of farming to combat climate change. The colloquium will feature two highly respected scientists, one from Europe and one from the United States, who can explain what’s possible and what’s needed to achieve desired results. We will also hear from two Tuscan farmers who are putting good farming practices to work on their land. The colloquium is cosponsored by American Farmland Trust , a U.S. non-governmental organization with considerable expertise in farming practices. American Farmland Trust’s president will also speak. The program will be simultaneously translated in both Italian and English. The full day event begins at 8:30 and includes lunch. There is a charge of 10€. At the conclusion of the formal program (at 16:30), participants will have the opportunity if they desire to tour the farm operation at Spannocchia. For an additional charge of 20€, participants are welcome to stay for a celebratory dinner. A small group of Americans (approximately 15-20) will be attending the colloquium. This will ensure an interesting exchange of perspectives about farming on two continents. All presentations will be suited to a general audience. You will not need a scientific background to enjoy and learn from the program. Ariane Lotti is the co-owner and operator of Tenuta San Carlo located in the Tuscan Coast. Ariane is an Italian American who moved to Italy to keep her family’s farm in operation. Her farm, which primarily produces rice, is constantly experimenting with more sustainable farming practices. Dr. Jennifer Moore-Kucera directs the national climate initiative for American Farmland Trust. She previously directed the U.S. Department of Agriculture’s Northwest Climate Hub and served on the faculty of Texas Tech University specializing in soil health. John Piotti is president of American Farmland Trust. John has worked on issues of sustainable agriculture and conservation for over 25 years. In 2005, he received a prestigious Eisenhower Fellowship, which he used to study agriculture in Sweden and agricultural policy in the European Union. Randall Stratton owns and operates Spannocchia with his wife Francesca, a farm which has been in Francesca’s family for over 100 years. During their time as stewards of Spannocchia, the farm has embraced sustainable agricultural practices and helped reintroduce heritage breeds.